manila fashion observer: Sea Sick! In a good way! Isn't this the height of nautical? 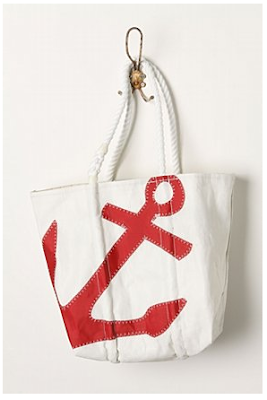 An anchor themed bag made out of recycled sailboat sails! Sosyal! You're not only green, you can even pretend you've got the greenbacks! "Oh, this old thing? It's made out of boat sails!" And people can just jump to the conclusion you got sails off Daddy's boat and whipped it into a bag. Sea Bags are also available in Anthropologie. This post was simple yet cool. I like the bag, it was simple yet fantastic. Big thanks.